It was not until 4 pm that the body was removed from the enclosure and his family arrived to identify the deceased. A little after 1 pm, Maqsood found himself cowering under the gaze of a white tiger named Vijay, which stood a few inches away from him. Half an hour later, the 22-year-old, who is said to have fallen into the enclosure, was killed by the male tiger. Maqsood’s father later told police that he had been “mentally disturbed” since the age of 11. Eyewitnesses said once he fell into the enclosure, the tiger approached the youth. Maqsood, who eyewitnesses said, seemed stunned after a 18-foot drop over the fence, stayed fixed to the spot as the animal drew closer. An group of 50-odd people began screaming and pelting stones to deter the tiger but this, said zoo officials, only agitated the six-foot tiger further. The crowd watched helplessly as the tiger closed in on Maqsood. After swiping at Maqsood once, the tiger killed him by crushing his neck with a single bite, officials said. The police said Maqsood’s father Mehfooz told them of his son’s mental problem but he did not show any medical documents to support this claim. Mehfooz told police that the youth had left their Anand Parbat house around 8.30 am. The tiger grabbed Maqsood by the neck and dragged him away from the dried-up moat where he had fallen, but eventually let go of him and retreated. 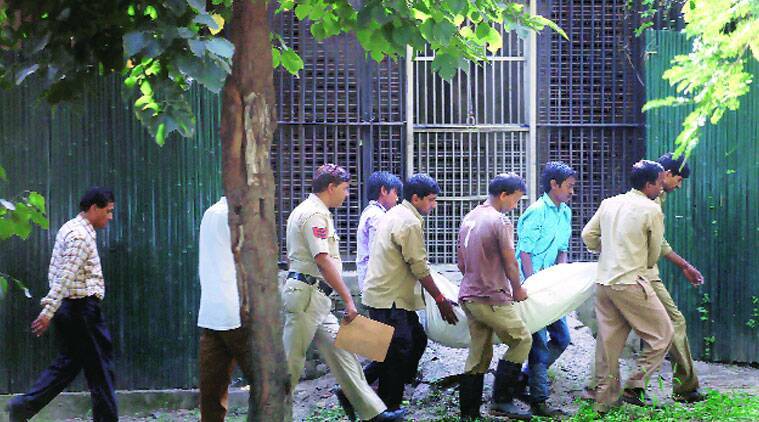 His body remained in the enclosure till almost 4 pm before zoo officials and police removed it. Zoo Director Amitabh Agnihotri later said in a statement that “all the enclosures of the National Zoological Park (Delhi Zoo) are absolutely safe”. “No visitor can reach the moat wall of the enclosure without crossing the standoff barrier. This visitor (Maqsood) crossed the standoff barrier and ultimately jumped into the enclosure which led to his death by tiger,” the note said. 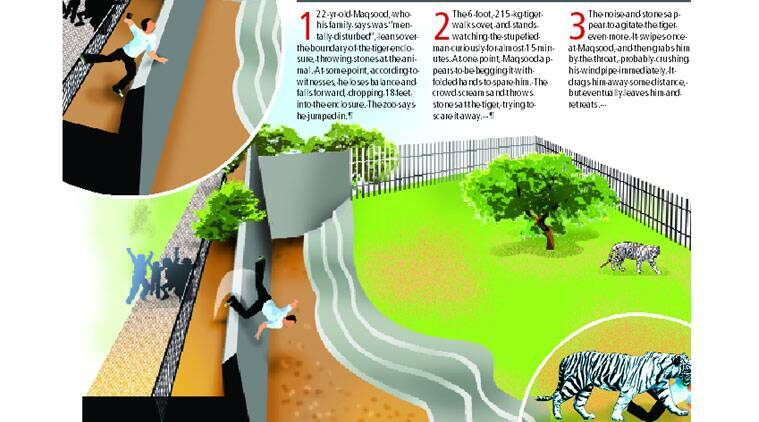 Agnihotri also claimed that the victim “crossed the barrier of the enclosure and jumped in”. But eyewitness said he had lost his balance and fell inside while trying to throw stones at the tiger. “He had gone very close to the final barrier between the tiger’s enclosure and the area where visitors can stand in order to aim better. He was throwing stones at the tiger,” Bittoo, an eyewitness who recorded the entire incident on his phone, said. But eyewitnesses, who had seen Maqsood fall, said he hadn’t jumped into the enclosure, but lost his balance while trying to lean on the moat wall. “After he fell down, the white tiger which was further inside the enclosure, came towards Maqsood. As the tiger came closer, he clasped his hands and seemed to be praying. The tiger watched Maqsood closely for almost 15 minutes,” Himanshu, another eyewitness who had made the call to police, said. In those 15 minutes, zoo officials later claimed, the guard posted at the enclosure sounded the alarm and sent wireless SOS messages. The crowd had by now become extremely agitated and was screaming frantically, throwing stones at the tiger to deter it. “It was only after the stones were thrown that the tiger attacked,” Iftikhar, another eyewitness, said. Questions were also raised by other visitors about the zoo’s own ability to deal with such incidents. “It took them almost 20 minutes to arrive at the spot. They were ill-prepared for such accidents. They didn’t even try to tranquilize the animal,” Veena Sharma, a visitor, said. The zoo, however, denied the charges and said that tranquilizing an agitated tiger is a complicated process and was not practical in the situation. The seven-year-old tiger’s bite in the back of the neck could have crushed Maqsood’s windpipe. The police said the exact cause of death would be ascertained by a post-mortem examination. By then, the zoo officials had managed to drive the tiger into a small cage within the enclosure. All visitors at the zoo were asked to leave by then. Police said that a case under section 304A (Causing death due to negligence) of the Indian Penal Code had been registered at the Hazrat Nizamuddin police station.